The designations employed and the presentation of the material in this document do not imply the expression of any opinion whatsoever on the part of the United Nations or the Food and Agriculture Organization of the United Nations (FAO) or IUCN - the World Conservation Union, concerning the legal or constitutional status of any country, territory or sea area, or concerning the delimitation of frontiers of boundaries. 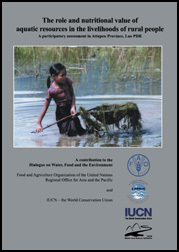 As a joint initiative to investigate the relationships between living aquatic resources, rice agriculture and the livelihoods of the people who manage these systems, this document is a contribution to the Dialogue on Water, Food and the Environment by the FAO Regional Office for Asia and the Pacific and IUCN - the World Conservation Union (IUCN). This document isbasedupon a field report prepared by Eric Meusch and Jintana Yhoung-Aree with additional authorship and technical editing by Richard Friend (IUCN) and Simon Funge-Smith (FAO). All rights reserved. Reproduction and dissemination of material in this information product for educational or other non-commercial purposes are authorized without any prior written permission from the copyright holders provided the source is fully acknowledged. Reproduction of material in this information product for sale or other commercial purposes is prohibited without written permission of the copyright holders. Application for such permission should be addressed to: The Aquaculture Officer, FAO Regional Office for Asia and Pacific, Maliwan Mansion, 39 Phra Athit Road, Bangkok 10200, Thailand. For Copies please write to:The Aquaculture Officer, FAO Regional Office for Asia and Pacific, Maliwan Mansion, 39 Phra Athit Road, Bangkok 10200, Thailand.